This week, Drew Brees broke one of the most iconic records in the National Football League, surpassing Peyton Manning as the all-time career passing yards leader. Brees shows no signs of slowing down at age 39 and is an MVP contender with the Saints sitting at 4-1 so far in the 2018 season. Brees’ place in the history books is unquestioned. He’s an 11-time Pro Bowler, a Super Bowl champion and MVP, and will likely own career records in yards, touchdowns, completions, and completion percentage when he finally calls it quits. (Given his performance thus far this season, it’s impossible to tell when exactly that might be!) If that doesn’t impress you enough, consider that Brees owns five 5,000 yard seasons in his career while every other quarterback in league history combined owns just four. Brees belongs in the same breath as Brady, Montana, Marino, Manning, and the others who can stake a claim to be the greatest of all-time. While the debate over who exactly is number one will always make for interesting conversation, Brees will certainly have the record books as a point in his favor. As a tribute to one of the greatest ever, here’s a look back at Brees’ career with the Saints and the nine performances that best define his tenure. The marriage of Drew Brees and Sean Payton paid immediate dividends for the Saints as the pair led New Orleans to their first ever NFC Championship in 2006. In those early weeks, it was hard to tell that so many records would be shattered in the decade-plus that was to come. It seems unfathomable now, but Brees was 16/30 for just 170 yards in his debut for the Saints, which was a road win against the Browns. By midseason, we saw flashes of the historic output that was to come and no performance was better than a Sunday night win on the road against Payton’s mentor Bill Parcells in Dallas. Brees threw the first of nine 5+ TD games with the Saints in a rout. Brees had bigger statistical games in 2008, but his first game against his old team had to carry a special added importance. Brees spent the first five seasons of his career with the Chargers and one of the great what-if scenarios in sports is what would have happened had he stayed in San Diego. Alas, the Chargers went with Philip Rivers and let Brees go after his devastating shoulder injury. Brees got the best of Rivers in this shootout from London and has a 3-0 record against his former club. Believe it or not, Brees has only one game in his career with a perfect quarterback rating. It came in what may have been the biggest regular season game of his career – a Monday Night showdown against Tom Brady, Bill Belichick, and the New England Patriots. The Saints were 10-0 at the time on their way to a Super Bowl and this dominant victory only foreshadowed the glory that was to come. It won’t be Brees’ most eye-popping statistical numbers, but it will always be his most important victory. 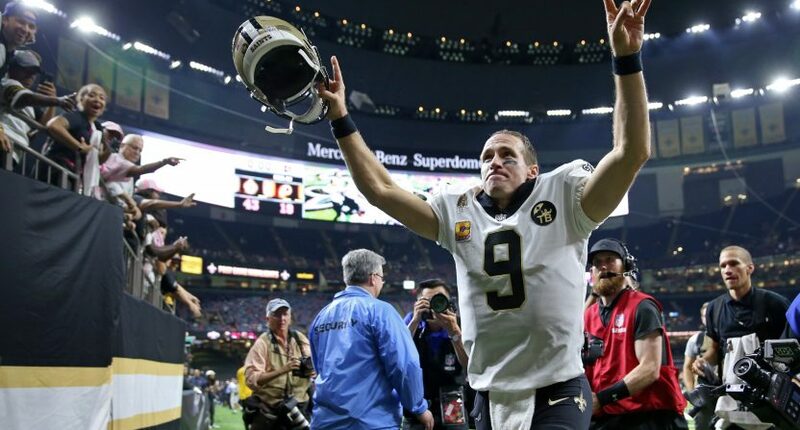 Brees beat the two men he passed on Monday night, Brett Favre and Peyton Manning, in back to back games to win the first ever Super Bowl for New Orleans. Brees was clinical in the championship game in Miami against the Colts, completing a then-record 32 passes in a Super Bowl along with 2 TDs and 0 INTs. Brees was at his best when it mattered most, going 7/7 on the Saints’ final drive in the 4th quarter finding 7 different receivers to take a 24-17 lead. Tracy Porter’s Pick 6 sealed it and history was made. The Saints set all sorts of records in this Sunday Night Football shellacking of the Colts, setting new franchise marks for points and winning margin. Brees finished with more TD passes than he did incompletions. And the numbers could have been even better because Brees was replaced by Chase Daniel before the fourth quarter even started. The combination of Curtis Painter and Dan Orlovsky didn’t quite match the heights of Peyton Manning like two years before. That 2011 Saints team was arguably even better than their Super Bowl team two years earlier. Thanks to the additions of Jimmy Graham and Darren Sproles, the Saints set an NFL record with 7,474 yards of total offense. However, their 13-3 record was only good enough for the #3 seed in the NFC behind the 49ers and Packers. The Saints would eventually lose an epic in the Divisional Round to the 49ers, but not before Brees torched the Lions in the Divisional Round with a monster performance. We will never know how many more wins or championships New Orleans would have if they had a defense that could consistently rank in even the top half of the league. Brees and the Saints have had more than their fair share of ridiculously entertaining shootouts over the years, but none was as crazy as this 2015 game against the Giants. Brees tied an NFL record with 7 TDs in a game and tallied his second career 500 yard game, and he needed every bit of it as Eli Manning threw 6 TDs of his own for the Giants. It was only the fourth game in NFL history to top 100 combined points. The Saints were struggling in the early stages of the 2018 season after a shocking Week 1 loss to Tampa Bay and a fortunate Week 2 win against Cleveland. For a team with Super Bowl aspirations, a road trip to their arch-rival Falcons was a significant gutcheck. Brees was flawless throughout the game, but the Saints found themselves behind in the fourth quarter. Ironically, Brees’ signature play was actually a rushing touchdown. Although not known for his scrambling ability, Brees broke free from two would-be tacklers with a spin move to score the tying touchdown. He then added a patented goalline leap over the top for the winning touchdown in overtime. Brees’ most recent game was all about breaking the all-time passing yards record of Peyton Manning. The NFL astutely scheduled it so that it would happen in primetime on Monday Night Football (where Brees has had more than his fair share of astounding performances). And true to form, the moment could not have been scripted any better with his record-setting throw coming on a 62 yard touchdown pass to Tre’Quan Smith just before halftime. But the highlight of the night may have come in the aftermath – Brees’ moment with his young children and telling them they could do anything in life if they worked hard brought us one of the great heart-warming scenes in league history. Beyond the record though, Brees played one of his best games ever. The Saints didn’t punt all night and Brees had the best single-game completion percentage of his career. Brees has 11 TDs to 0 INTs this year, a 77.9% completion percentage, and a 122.3 QB Rating. Given the way Brees continues to get better with age, he may have a few more games to add to this list before it’s all said and done.